"These red-skinned mashed potatoes are just the creamiest. They are always a hit with company. Just a warning: they are addictive!" Place the potatoes into a large pot, and fill with enough water to cover. Add 1 teaspoon of the crushed garlic to the water for flavor. Bring to a boil, and cook for about 10 minutes, or until easily pierced with a fork. Drain the potatoes, and add the butter. Mash until the butter is melted. Mix in the half-and-half, steak seasoning, garlic powder, sugar, and remaining garlic. Mix potatoes with an electric mixer until smooth. Watch how to infuse mashed potatoes with the magical flavor of garlic. Absolutely awesome. Made the recipe exactly as stated, except I used heavy cream instead of half and half, and I omitted the sugar. Phenomenal! 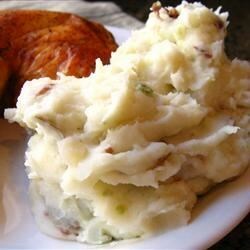 The best mashed potatoes I've ever had!!! But BEWARE, and only put in 1 tablespoon of sugar.